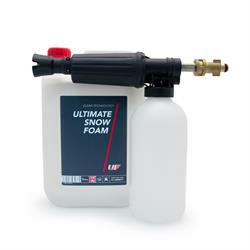 1 Litre Ultimate Snow Foam Lance & 5 Litres of Ultimate Snow Foam. The perfect combination! NEW & IMPROVED Foam Lance and AutoExpress winner, Ultimate Snow Foam. High quality foam lance connects to your existing pressure washer and combines pressurised water with Ultimate Snow Foam product to create a true 'snow foam' effect. Twisting the main body of the lance adjusts the ratio of product to water, altering the thickness of the foam created. The adjustable nozzle on the front of the lance allows the user to select either a horizontal or a vertical spray pattern. Simply spray Ultimate Snow Foam over your vehicle and watch as it swells, lifting the dirt away from the surface of the car or motorcycle. Ultimate Snow Foam is a PRE-WASH CLEANER designed to remove excess grime and lift the dirt away from the surface, thus reducing the risk of scratching during subsequent washing. NOTE: Ultimate Snow Foam is a pre-wash cleaner designed to be used in conjunction with normal shampoos. The amount of foam produced will be dependent upon the dilution ratio, water pressure and the application method. Ultimate Snow Foam can be diluted in the 1 Litre bottle as required. Ratios depend on foam thickness required and water pressure.